...by Hong Kong-born South Korea-based rapper (and GOT7 member) Jackson Wang, who made his way from the front row to perform “Fendiman”, and his latest single, the Gucci Mane-featuring track “Different Game”, at the end of the show. 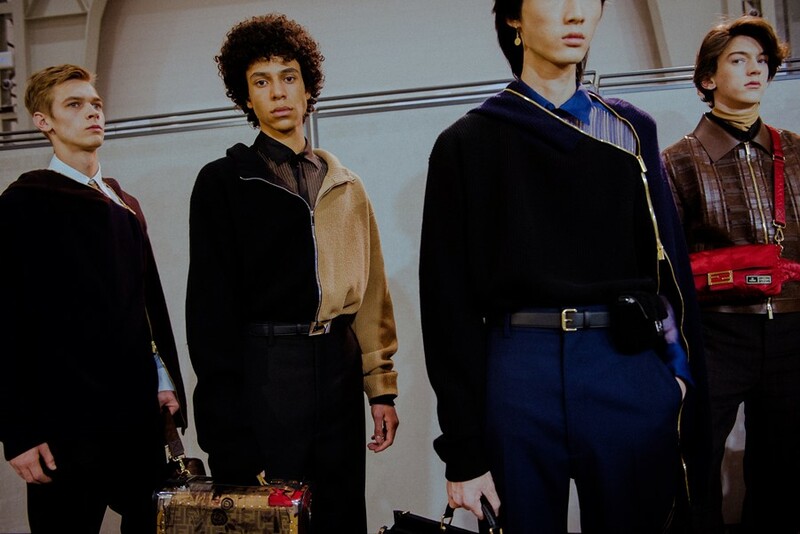 Last season, Venturini made a case for the man bag, as she sent a series of document holders, duffles, and clutches (many bearing the iconic FF logo) down the runway. This time around she hammered the message home, adding new printed, velvet, and shearling iterations of the classic Fendi Baguette into the mix. Resistance is futile, apparently. The half-and-half trend was everywhere last summer (more on that here and here), and it seems like it’s still going to be a thing for a while yet: models at today’s show tread the catwalk in tailored suits, neat shirts, and shearling jackets with one side black or navy and one side beige. As well as the muted, tonal looks that the Italian house is renowned for, there was a series of printed styles incorporated into the collection. Abstract, graphic motifs emblazoned puffa coats and bags, while a more kitschy, collaged one was seen across tailored outerwear and classic boxy luggage.